"Denied the opportunity to use their talents in the service of their country, they began to operate what they called 'The Operation'. They would select a victim, and then threaten to beat him up if he paid them the so-called protection money. Four months later, they started another operation which they called, 'The Other Operation'. In this racket, they selected another victim and threatened not to beat him up if he didn't pay them. One month later, they hit upon 'The Other Other Operation'. In this, the victim was threatened that, if he didn't pay them, they would beat him up. This, for the Piranha Brothers, was the turning point." Welcome to season two, where the Pythons are hitting their stride. I consider myself lucky to have found MPFC whilst still in high school back in 1983. One just wouldn't expect to find this sort of show on a PBS station in Utah (thank you KUED!). Something in my psyche resonated to the sublime, surrealistic and downright silly humor found on this program. It was so different from standard American comedy that beat you over the head. On Python, the humor was tangentially delivered and you either got it or you didn't. When I bought my first laserdisc player in 1990, I wasted no time in buying the first four discs (out of thirteen) of MPFC released by Paramount. Unfortunately, none of the laserdiscs have any sort of episode or seasonal order. What's worse is that I couldn't find the other nine discs anywhere, so, I've been stuck until now. With the advent of A&E's release on DVD, I get a second chance to pick up the entire series—in proper order—on a medium that will hold up over many a repeated viewing. This episode, which is nearly one long segue from one sketch to the next, starts off slowly with Face the Press where we have Eric Idle hosting a commentary between the Minister for Home Affairs—Graham Chapman in drag—and a small patch of brown liquid. Next we have John Cleese—also in drag—as the Air Chief Marshall, making a statement about his new promotion on TV, which becomes a telly in a house where Mrs. Pinnet (Terry Jones—in pepperpot mode) is watching. After discovering she's in the wrong house and crossing over the backyard wall to the house next door, we start New cooker sketch. This is bureaucracy at its finest, all started by a wrong name on a form. The problem is solved by Mrs. Pinnet's death and several dozen gas company employees in line that runs around the block and into a Terry Gilliam animation. In this, we have a world filled with aircraft in the shape of monarchs. One of the pilots gets a nasty shaving cut and an ad is posted on the bulletin board of the chemist shop run by Jones. This is where Idle, in his role of dirty old man, is looking for a bit of fun and hoping to find it in one of the ads. Of course, since all he knows is innuendo, he's having a heck of a time with ads for things like 'small white pussycat for sale', chest 'n' drawers, pram for sale ("I'd like a bit of pram, please"), babysitter and blood donor ("I'd like to give some blood please, whaaaaa!"). After giving up, he needs an explanation for 'blond prostitute available...'. Cleese then steps into the shop for his morning paper and then leaves to continue his walk to the office (and passing the line of gas company people). Only it's the most bizarre walk ever seen on TV because Cleese works at The Ministry of Silly Walks. Here we find Michael Palin asking Cleese for a government grant to develop a new silly walk. After a bit of discussion and a short film of silly walks, Cleese offer Palin a position on the research team for the Anglo-French silly walk 'le Marché Futile', which is then given it's grand unveiling. On to the only part of the show not tied in some way to the preceding sketch, 'Ethel the Frog', a news documentary covering the exploits of the Piranha brothers—Doug and Dinsdale—extortionists extraordinare. Dinsdale's chief weapon was nailing people's heads to the floor and Dinsdale used...well...he used...sarcasm. After a number of interviews with various people, the brother's only real enemy turns out not to be Chief Constable Harry "Snapper" Organs (Jones), but a giant hedgehog named Spiny Norman. Strongest moment(s): The Ministry of Silly Walks is one the most popular Python sketches ever. Which probably explains why Sony used a variant of it with a mechanical version of Cleese and Cleese himself doing the voiceover on an ad for CD players that won a Cleo back in 1985. Weakest moment(s): Face the Press. I thought the minister's reply more humorous than what he was wearing. This episode starts out with Man-powered flight, where Palin is trying out his self-powered flying apparatus, which appears to actually work until we discover that the camera was turned sideways and he was really falling off a cliff. Next we find that [music sting] "Nobody expects the Spanish Inquisition!" This skit runs through the entire episode and is filled with fear, surprise, ruthless efficiency, an almost fanatical devotion to the Pope and nice red uniforms (not to mention diabolical laughter). Cardinals Ximenez, Biggles and Fang (Palin, Jones and a rare live appearance by Gilliam) are merciless, subjecting heretics to such tortures as the [dish] rack, soft cushions and The Comfy Chair. After starting the first of the inquisition sketches, Chapman is taken across town to star as the straight man in Jokes & Novelties Salesman, where Idle tries to sell him things that are "guaranteed to break the ice at parties". Unfortunately, Chapman wasn't told his line, which just happened to be the punchline. Then Chapman's head is borrowed for a Gilliam animation where solders are in need of a cannonball and use Chapman's eye. The animation continues but I'm afraid I can't describe it, it's too strange. After that, we join a government meeting where a decision has to be made to come up with a new source of revenue. The answer is a Tax on Thingy. You know, thingy. (Fortunately, politicians haven't passed this in real life.) Some people on the street are then asked what they would tax. The best answer is a tie between Palin's "it's" man: "I'd tax Raquel Welch, but I'm afraid she'd tax me" and Jones' bureaucrat: "I'd tax all foreigners living abroad." Next we're treated to Photos of Uncle Ted, in front of the house, behind the house, coming around the side of the house, etc., etc. We're finally spared by another visit from The Spanish Inquisition, whose tortures are so great that it makes the following Gilliam animation confess. On to The Semaphore Version of Wuthering Heights, where flag signals substitute for dialogue (even snoring). We're then treated to other movie variants like Julius Caesar on an Aldus Lamp, Gunfight at the OK Corral in Morse Code and The Smoke Signal Version of Gentlemen Prefer Blondes. Next is Court Charades, which only starts out being charades, then mutates into a courtroom trial of a judge (Jones) who had ruled that a defendant—or exhibit A in this case—"be taken from this place and brought round to his place" in a previous trial. The presiding judge (Chapman), who is fed up with the lax court system and is off to South Africa for some real justice, sentences Jones to be burnt at the stake. This prompts the reply, "I didn't expect the Spanish Inquisition," and everyone in the courtroom turns to the door expecting the Inquisitors to barge through. Unfortunately, they're on the other side of town. Now it's a race to get to the courtroom before the show ends. We follow along, credits rolling, as the three men hop a bus and then dash to the court building. The climax is absolutely ROTFL! Strongest moment(s): Just about the entire episode is hilarious, but The Spanish Inquisition is pure outrageous Python. Weakest moment(s): There's a definite dead zone between the first Inquisition sketch and Jokes & Novelties Salesman. Unfortunately, J&NS doesn't quite get things going again. Episode rating: Five dead parrots out of five (would've been six out of five if not for the weak moment). Strongest moment(s): Déjá vu - Palin gets really jumpy. Weakest moment(s): This is the weakest episode on the DVD. Flying Lessons is very similar to Argument Clinic, with Chapman as the insult man. The intro goes on waaaaaay too long. Episode rating: Two dead parrots out of five. Image Transfer Review: Image Transfer Review: These have none of graininess of the laserdiscs. The image looks as good as one would expect from the source material. After all, Python was a low-budget BBC production. I would say that the transfer doesn't add anything to what was already there. Audio Transfer Review: Audio Transfer Review: The audio is all that can be expected from fairly decent original mono sound. I detected no wandering dialogue, and the problems of the audience laughter drowning out the actors on occasion, is due to the original recording, not the transfer. If you're not expecting THX quality sound, you won't be disappointed. This is another difference between the DVD and laserdisc versions - there are extras on the DVD. Although there are redundancies on all the DVDs, A&E has done a good job of packaging what they had to work with. In case this is your first look at a MPFC DVD review, I'll elaborate on the different sections in the Loony Bin. Meet the Chaps - a mini biography of each member of the main cast of Python. Each person's bio starts with a short clip of that person from one of the sketches, followed by a screen of personal information: birthplace and date, what university he attended and his connection to the other Python members. The next page of info contains that person's career highlights. Pythonisms - a pseudo-dictionary listing of terms and words used in Python sketches. Things like Upper-class Twit, albatross, disgustometer and Spam are defined here.For ordinary objects, like albatross, some of the definitions are real and some aren't. Gilliamations - snippets of Terry Gilliam's surreal animations from different episodes that have a common theme. Silly Walk Live! - not all of the discs have these excerpts from Live at the Hollywood Bowl. In this one, Cleese's walk is even sillier than the original sketch. I guess practice makes perfect. Naughty Bits - this is just what you think it is (wink, wink, nudge, nudge), naughty bits from different sketches. www.pythonshop.com - a DVD-ROM link to the A&E Python store on the World Wide Web, where you can order more DVDs or a slew of other Python stuff. While it is a very good packaging job by A&E to give Python fans a little something extra, I couldn't help but wish for something more. 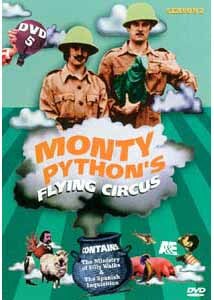 Unfortunately, I don't suppose that there are any Flying Circus outtakes still in existence. I would've liked to seen something that was cut from the original program, for whatever reason, or maybe a blooper reel. If you're a Python fan, these DVDs are definitely worth the money. In my opinion, there will never be a better time to get the whole series in one lump, so you can ease your cravings again and again.